Walking into the local grocery store this morning for some organic lemon juice, I saw shelves of Easter candy* on the left, flanked by shelves of bread and bagels on the right. Between them, was a large display for diabetes testing supplies which were available at the in-store pharmacy. The irony must not have been obvious to the staff or the rest of the customers. Then I visited the local big box home supply store and upon entering, I was greeted by stacks and stacks of Roundup on the left flanked by a sign about cancer awareness on the right. Again, the irony must have not been as obvious as I thought it was. One of the world's most popular weed-killers — and the most widely used kind in the U.S. — has been labeled a probable carcinogen by the International Agency for Research on Cancer. The U.S. Environmental Protection Agency, which makes its own determinations, said it would consider the French agency's evaluation. 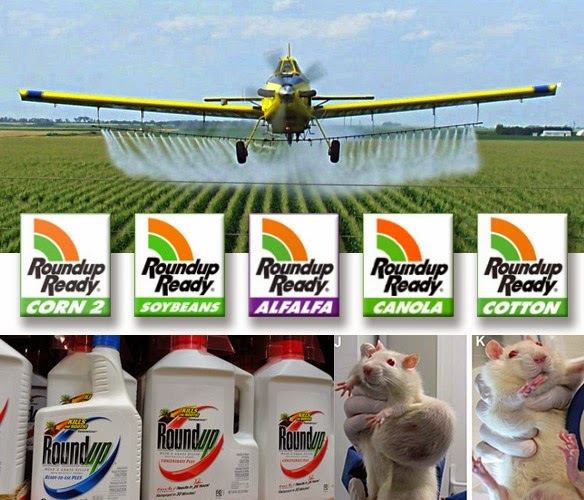 "All labeled uses of glyphosate are safe for human health," said Monsanto's Phil Miller, global head of regulatory and government affairs. * Why Pascha has morphed so entirely into the non-religious candy-fest of Easter, is unknown.